Memoirs from My Kitchen..: Tartufo.. an Ice cream truffle, what could be better? Tartufo.. an Ice cream truffle, what could be better? When I was a kid there was an Italian restaurant in my neighborhood that had the best desserts, Cannoli Tartufo, Tortoni.. Oh, it brings back such great memories of going there with just change to get one, running home and making it last a few days, just savoring a small bite every day and then wrapping it back up in the "nubby" foil and strategically hiding it in the freezer where nobody would look. "Tartufo" is Italian for truffle. The original "truffles" were created just after the French revolution by French chefs and were chocolate confections made to resemble like their prized fungi cousin in the Perigord region of France. These sweet confections were given at Christmas time as gifts. Sometime around the Victorian era is when the frozen truffle came about when the idea of molding ice creams into various shape like flowers, fruit, and other foods became popular. It has been only during recent times that ice cream "truffles" or "tartufos" have made a renaissance, of sorts. 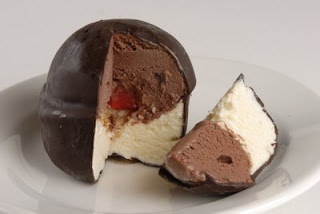 Typically, in Italy, a tartufo is a vanilla ice cream ball that has a cherry and some nuts in the center. The ball is then dipped in chocolate and can be covered with nuts or chocolate shavings. 1. Soak cherries in rum. 2. Sift sugar; cocoa, and instant coffee together and place in a heavy sauce pan. 3. Add the water and mix well. 4. Bring to a boil and cook until everything is well mixed. 5. While syrup is cooking, whip the egg yolks until light and fluffy. 6. Reduce the speed of the beaters to the lowest level and add the hot syrup in a continuous fine stream. 7. Continue beating until the mixture is thick and forms a ribbon pattern when the beater is pulled away. 8. Chill well. (about an hour). 9. Whip the cream with the 2 tablespoons of rum until stiff. 10. Fold into the chocolate mixture. 11. Fold in the chopped chocolate. 12. 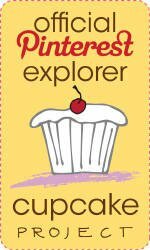 Arrange foil lined paper cups in a muffin pan. 13. Fill each cup 1/3 of the way full. 14. Place a cherry in each cup then fill the rest of the way. 15. Freeze at least 4 hours (preferably overnight). 16. Before serving pipe whipping cream on top if desired. 17. It will keep in the freezer for about a month wrapped tightly in aluminum foil.